As much as we like to keep things cool here at Mishimoto, we couldn’t keep ourselves away from the exhaust system once we got our hands on the hot new 2016 Camaro SS. This is a very impressive car, but we have a few ideas on how to make it even better. Now let’s give credit where credit is due; GM did pretty well on this one, and even the stock 2016 Camaro exhaust took our breath away. It sounds absolutely sublime, and I’m sure you will all agree after giving it a listen. But once our engineers picked their jaws up off the floor and stopped doing burnouts in the parking lot, they told us that we weren’t the only ones having breathing problems after hearing that monstrous 2016 Camaro exhaust. In fact, they told us that the exhaust might make it hard for that glorious LT1 to breathe too! Fortunately, this ailing patient came to the right doctors; our team reckons they can make some improvements to help this Camaro breathe better and even squeeze out some more power while they’re at it. First things first, let’s take a look at what we’re working with from the factory. For much of the system, the exhaust gases leaving the LT1 remain separate. Two sets of 2.75” diameter piping and emissions equipment run in parallel to evacuate exhaust from both the left and right banks of the engine. We will be enlarging the diameter of these passages on our 2016 Camaro exhaust system, so stay tuned! Once the exhaust gases leave both manifolds on either side, the first thing they encounter is an oxygen sensor. After being monitored, the gases surge through the first of two catalytic converters on each side (four total). Another O2 sensor is placed immediately downstream of this first cat to inform the ECU that the converter is functioning properly and emissions are in order. Still running in two parallel systems, the exhaust gases now encounter one more converter on each side of the car, but are left unmonitored – there are no O2 sensors after either of these two converters. At this point, we’ll turn around and look toward the back of the car to see both sides of the system bend inward and the pipes travel together down the middle of the car. An interesting element seen here is the utilization of an X-pipe, which is the one place in the system where gases from both banks meet; this type of design can have benefits ranging from exhaust scavenging to sound signature. GM chose to use an X-pipe, but they could have utilized several different types of crossover including H-pipes or even other X-pipes with more acute/obtuse angles. Our engineers will be looking into GM’s methodology here, so don’t forget to check back later for updates on their progress – We plan on making that LT1 sound so good, you’ll forget your car even has a radio! If you’d like a sneak peek at this element of our design process, you can check out a similar project here. Finally, the exhaust travels through two oddly-crimped pipes to the muffler, before being expelled through the tailpipe. Crimping is quite popular among my younger sister and her friends, but somehow I suspect that our Camaro is less than pleased (though it is quite stylish). The muffler on this car is worth a second look, particularly if your Camaro SS exhaust is fitted with the “dual-mode performance” option from the factory. This package equips the car with the NPP (not an abbreviation, just a factory code) exhaust first seen on the Corvette, wherein the ECU uses vacuum and throttle application to modulate electric stepper motors that open and close a butterfly valve in the muffler. The valve stays closed to keep the car quiet in low-RPM/light throttle situations by routing the exhaust more circuitously through the muffler, but it opens during more spirited circumstances to let your exhaust straight through and out of the tailpipe. Additionally, all cars with an automatic transmission (NPP and non-NPP cars alike) have two butterfly valves further upstream to regulate back-pressure during cylinder deactivation mode – these cars feature an active fuel management system (AFM) that temporarily cuts fuel to four of the eight cylinders during highway driving to improve emissions and fuel economy. Keep checking back for updates on our progress through this project! We’re very excited to begin development on our 2016 Camaro exhaust, and we look forward to sharing our R&D process with you. I thought it was 2 Cats and 2 resonators not 4 cats? Hey Stephen – Although they do look like they could be resonators, they are indeed unmonitored cats. 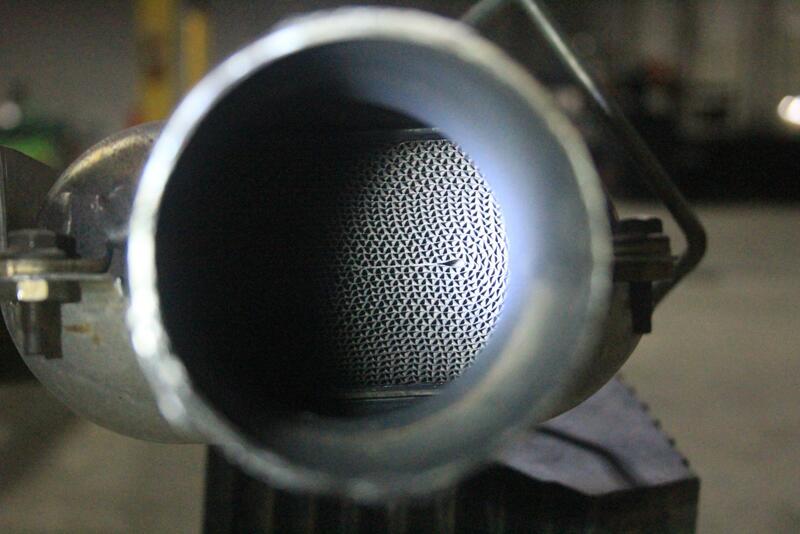 We’ve got the exhaust off of the car so it’s easy to look inside and see the honeycomb design of the converter – I snapped a quick photo so that you can check it out for yourself!